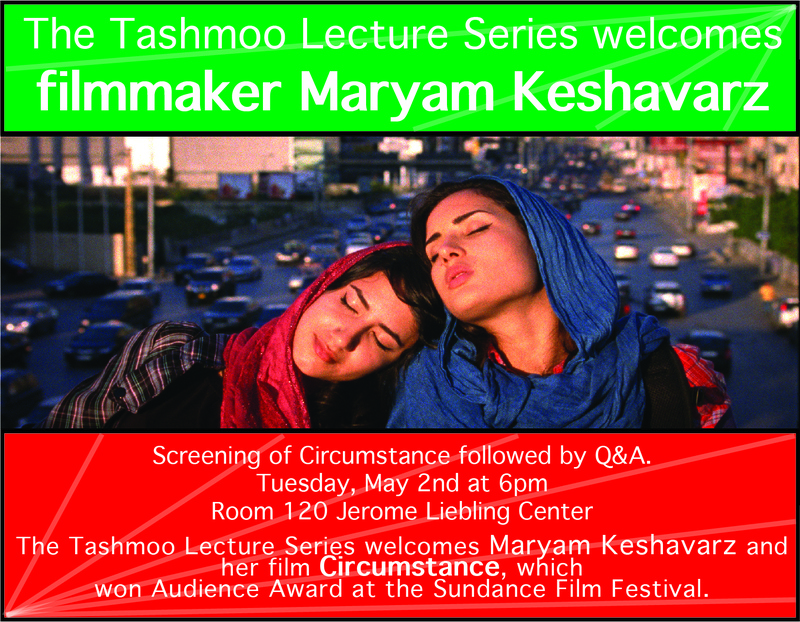 Please join us in welcoming Maryam Keshavarz and her film Circumstance. We are excited to announce our screening on May 2nd at 6 pm in Jerome Liebling Center room 120 at Hampshire College. The screening will be followed by a Q&A with the director. 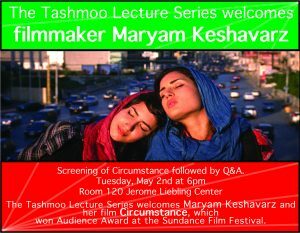 Circumstance, a film shot and set in Tehran, Iran, won the 2011 Audience Award at Sundance Film Festival, the 2011 Outfest Audience Award, the Rome International Film Festival Best First Film and several other awards. Attached is the poster and below is further information about the film and the filmmaker. The once close siblings find themselves at dangerous odds with each other. As violence and desire collide, the once safe haven of the family home becomes increasingly claustrophobic and threatening. She received her MFA from NYU/ Tisch in film direction and has been making award-winning films for 11 years. Maryam’s first feature documentary, THE COLOR OF LOVE, an intimate portrait of the changing landscape of love and politics in Iran, won numerous awards at top-tier festivals and was broadcast internationally. Maryam’s short film THE DAY I DIED garnered top accolades at Mar del Plata, Clermont-Ferrand, New York Film Festival and Berlin International Film Festival; and was the only short film at Berlinale to win two awards: the Gold Teddy and the Jury Prize. Along with frequent collaborator Paolo Marinou-Blanco, Maryam is penning the narrative adaptation of the award winning HBO documentary HOT COFFEE. Maryam is attached to direct the narrative adaptation, entitled The Dissent, with Academy Award nominated producers Anna Gerb, Neal Dodson, and JC Chandor (A Most Violent Year,Margin Call, All is Lost) producing the film in 2017. Maryam is also developing gender bending genre defying historical epic musical film, THE LAST HAREM. For this insanely ambitious project, Maryam has garnered several high profile awards for the project including the Hearst Screenwriters Grant, the San Francisco Film Society/ KRF Screenwriting Award, the prestigious Creative Capital Fund, and invitation to the Yaddo Writers Residency. Maryam is alumni of the Sundance Screenwriters and Directors Lab, Tribeca Film Institute’s All Access Program. She is the recipient of dozens of grants and fellowships including the French Government’s Fonds Sud, Rotterdam Film Festivals’ Hubert Bals Award, Women in Film Grant, Adrienne Shelley Award, numerous Sundance fellowships, multiple San Francisco Film Society grants. She has been a visiting artist at the University of Pennsylvania and guest lecturer at dozens of prestigious international universities. She is an active member of Film Independent serving as a mentor for their Project Involve Initiative and speaking on numerous filmmaking panels.